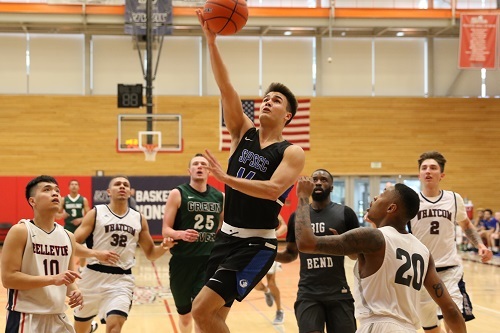 Three student-athletes represented Clipper Athletics and the West Region at two high-scoring Northwest Athletic Conference (NWAC) All-Star games on Sunday, March 17, in Everett. Sophomore guards DeMonte Malloy and Hunter Sipe played for the East-West All-Stars, where they fell to the North-South 129-125. Sipe, named NWAC West Region Defensive Player of the Year, was second in rebounds with 11 and second in scoring with 20 points. Malloy trailed closely with 18 points and 8 rebounds. Sophomore guard and forward Trinity Betoney scored 15 points in the women’s All-Star game, a 110-89 win for the East-West over North-South. During the season, Betoney averaged 21.6 points and 10.1 rebounds per game and was named the NWAC West Region MVP. Betoney, Sipe, and Malloy will graduate from SPSCC this spring. The three student-athletes plan to continue their studies and basketball careers at 4-year universities and are currently considering offers.